At AEIB, we manufacture a wide range of fans for industrial environments, particularly for large industries. Among our products, are the axial fans designed to extract or blow clean air gas or slightly dusty air from inside the premises. The high performance axial fans’ distinctive feature is that they can be linked up to a network of shafts or directly fixed onto a wall for immediate use. 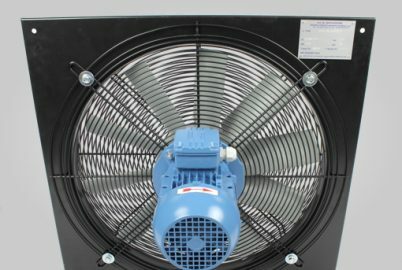 Among our range of axial fans, we also offer short or long cased fans with integral bell mouth operations, wall fans, pneumatic fans and oscillating pedestal fans. We offer everything you need to improve your industrial atmosphere. Axial fans display a sheet metal casing containing a propeller fan blade, powered by an electrical engine. 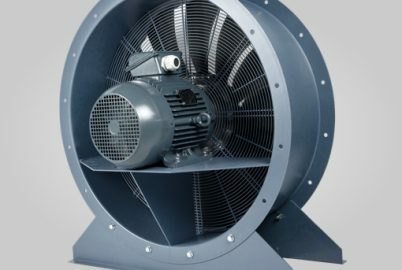 These fans feature unique feature lays in the propellers design to offer the best performance, and therefore to provide better pressure to evacuate fluid gas, toxic vapours or moist dusty air. To ensure our axial fans are both reliable and robust, we rely on the expertise of our teams and technicians who use their savoir-faire daily. We also rely on ATEX certifications (in compliance with 94/9 /EC directives). We are ISO 9001 certified; we comply with European standards and regulations, which means that we have a strict manufacturing process that ensures quality products for our clients. We also manufacture a wide range of extraction turrets for clean and dusty air extraction as well as centrifugal fans for the industrial sector.